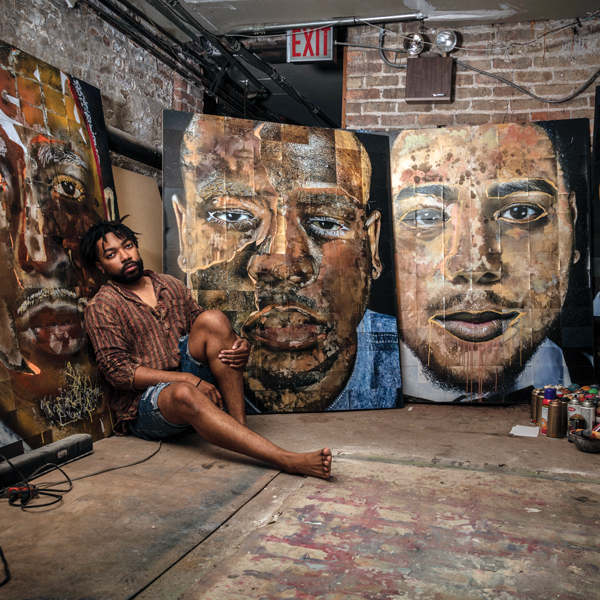 Johnson sits surrounded by his larger-than-life #InHonor portraits. “I CAN’T SPEAK FOR ALL ARTISTS, but I know for myself personally, I use my work to figure out how I want to exist and how I see myself,” says Ervin A. Johnson ’12. The multidisciplinary artist—best known for his deconstructed photo collages and colorful, abstract expressionist, mixed-media paintings—creates work that tries to disrupt and change the perceptions of black men and women. Specifically, Johnson is interested in depicting the femininity and humanity in the black body, two things that historically have been denied or ignored. Johnson cites his time at Columbia as a catalyst in the development of his artistic practice. At Columbia, Johnson learned the logistics of photography and experimented with painting. 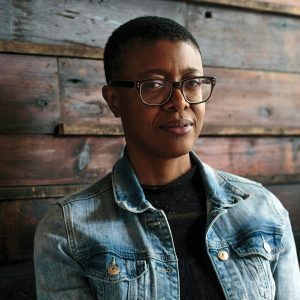 In 2016, Johnson also received the Diane Dammeyer Fellowship in Photographic Arts and Social Justice through Columbia and anti-poverty organization Heartland Alliance—which included a $25,000 stipend to create socially conscious work. An art history class introduced him to the philosopher Walter Benjamin and his concepts of art in the age of mass reproduction. “The notion of reproduction is important just because I’m trying to alter the perception of black men and women,” says Johnson. As a photographer, Johnson creates mass reproductions of images of black people. Later, he cuts, paints over, strips, and reconfigures those photographs to create entirely new works. Johnson pulls back on the reconstruction, he says, when the original humanity in the image is no longer there. Johnson is renegotiating how people understand and interpret black bodies and their existence in this world. 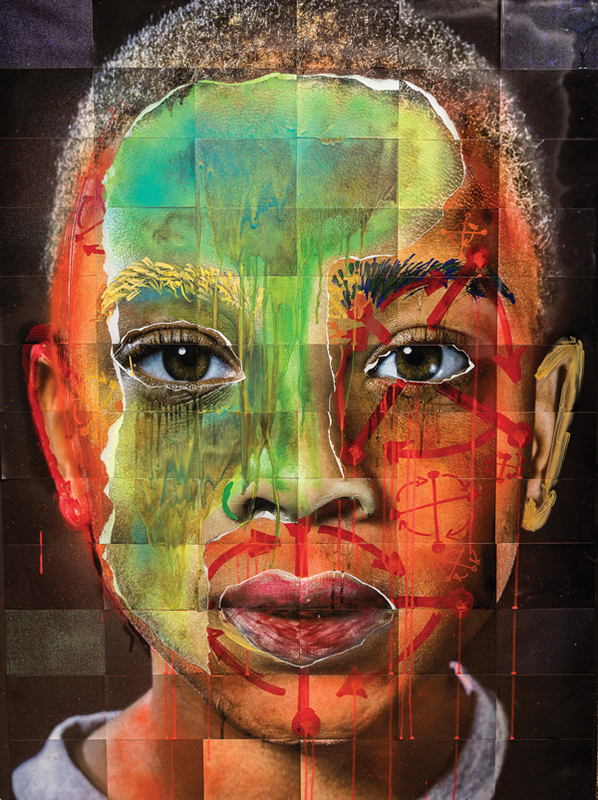 His work—large and evocative—tells a new narrative of blackness. “George,” #InHonor series, photo-based mixed media, 2016—Johnson photographs his subjects in Chicago, Atlanta, and New York City. 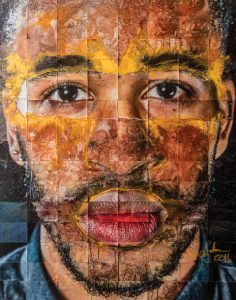 He enlarges their portraits and recreates “skin” using paint, glitter, paper, and other media. 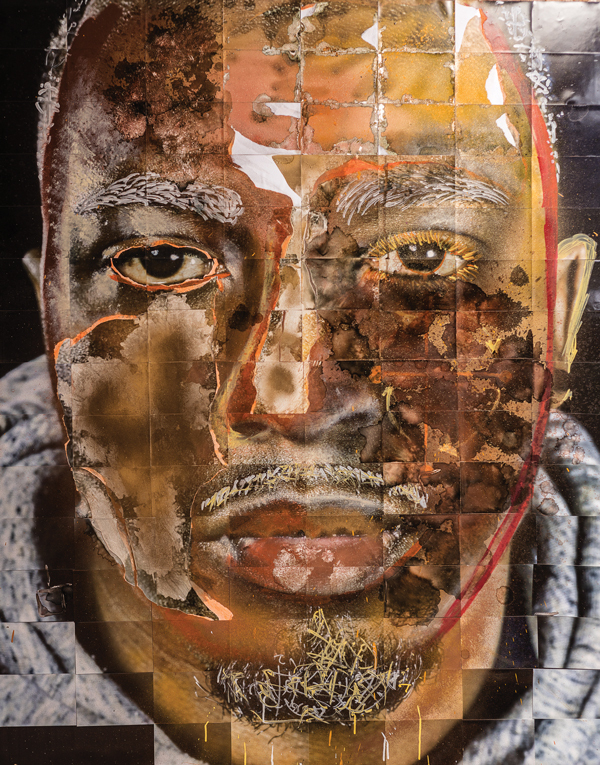 “Victor,” #InHonor series, photo-based mixed media, 2016—Johnson’s aggressive, hands-on process of creating his #InHonor portraits (including occasionally ripping the canvas) reflects the violence of police brutality and American society’s hostility toward black people. “I DECIDED TO GO BACK to school because I wanted to have more tools in my toolbox,” says Krista Franklin MFA ’13. Prior to entering Columbia, Franklin worked almost exclusively as a writer and poet. 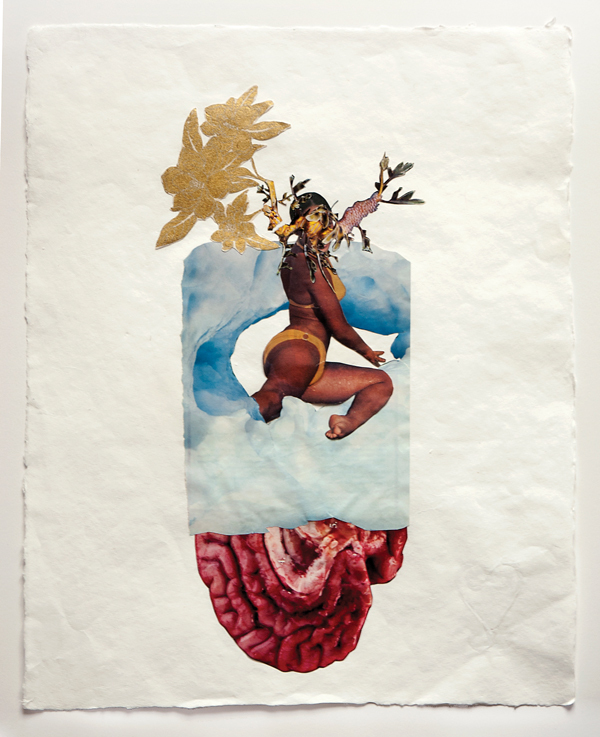 She began making mixed-media collages to work through writer’s block. 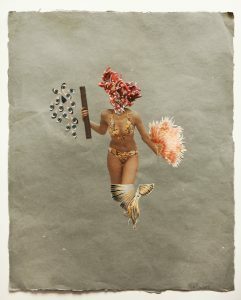 Although she never obtained a formal art education as an undergraduate (Franklin got her degree in Pan-African Studies), she took to the collage medium. 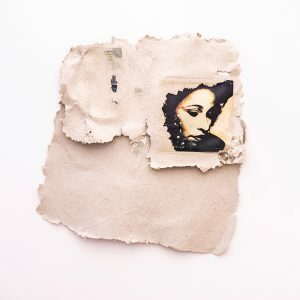 Franklin often centers photographic images of black women or celebrated cultural figures like Run DMC in her work while playing with material as varied as magazine cutouts and craft ribbon. Soon, her collages found popularity among her peers. “It was really the poets in my life—the writers in my life—who realized what I was doing visually and inspired me to put it in the public eye,” she says. 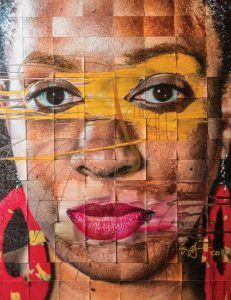 Her time at Columbia in the Center for Book and Paper Arts allowed her to master her new creative outlet in collage. 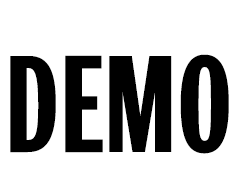 “Let me think of this as a craft, as an art practice, and let me consolidate it and put it in the framework of what I already do with my writing as an interdisciplinary artist,” she says about her decision to go back to school. Many of her pieces are inspired by her deep love of science fiction and fantasy. Franklin cites the science-fiction writer Octavia Butler as one of her biggest influences. Butler is one of the best-known African American writers of the genre. 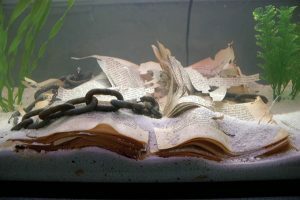 Franklin says her 2013 project, The Two Thousand & Thirteen Narrative(s) of Naima Brown, about a girl changeling on the precipice of young adulthood, was inspired by Butler’s work. We Wear the Mask II, collage on handmade paper, 2014—Franklin’s work emerges from her interests in science fiction, surrealism, fantasy, mythmaking, and black identity. 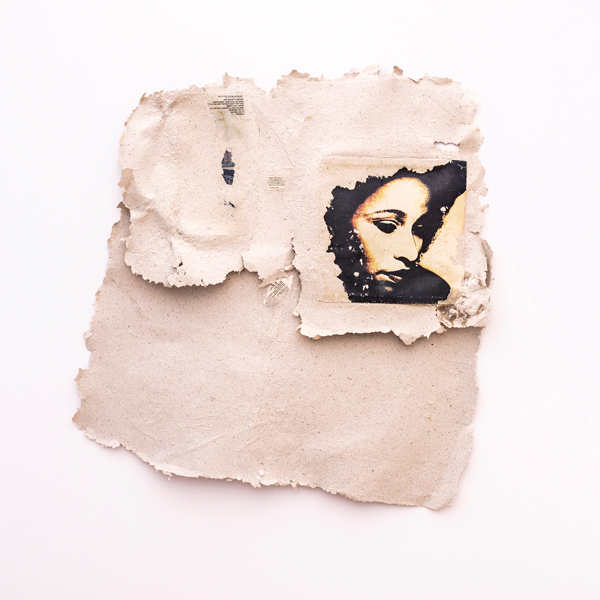 To the Limit To the Wall, album covers in handmade paper, 2016—Many consider Franklin’s work to be AfroFuturist: an aesthetic combining history, fantasy, science fiction, magical realism, and Afrocentrism. We Wear the Mask VIII, collage on handmade paper, 2014—We Wear the Mask investigates negative perceptions of women by fusing female bodies with parts of animals, plants, and other organic entities. 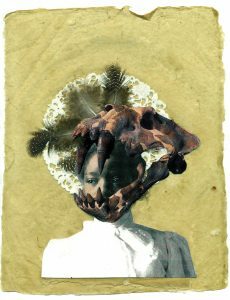 We Wear the Mask I, collage on handmade paper, 2014—The series inspiration comes from 19th-century poet Paul Laurence Dunbar’s poem “We Wear the Mask,” which explores surviving in the world as a person of color. At Columbia, Johnson studied journalism and photojournalism. 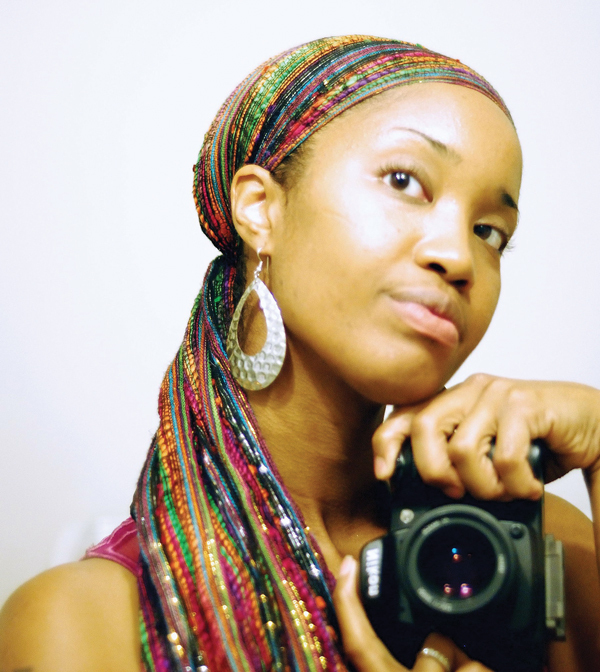 Her work focuses on capturing neighborhoods of Chicago that are typically only seen in one light. 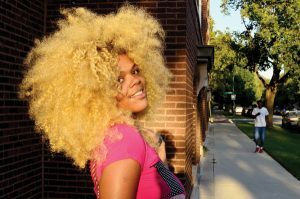 Johnson grew up in the city, largely in the Englewood neighborhood and on the North Side of the city. She began photographing her community while in high school. Rob and Lakeisha In Love—A young couple walks hand in hand after purchasing a bag of snacks from the corner store on 66th and Morgan streets. 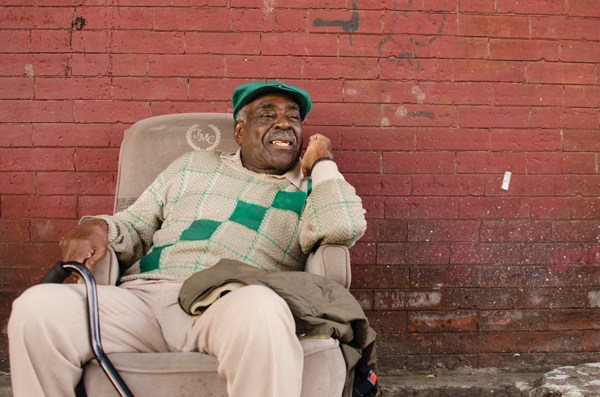 Color of Money—Lil Willie relaxes on a stoop at 64th Street and Racine Avenue. 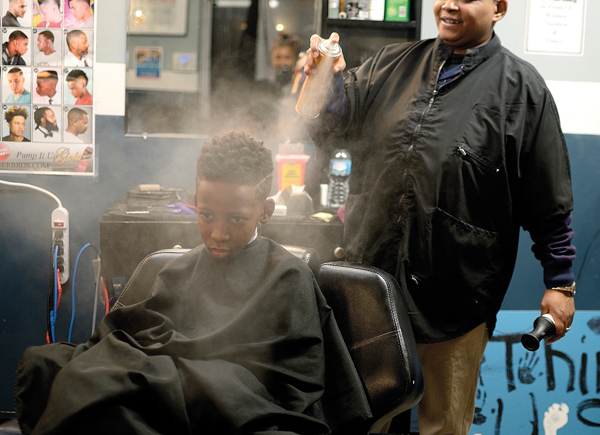 Barbershop—A young boy gets the finishing touches on his new haircut at Longevity Barber Lounge on 68th Street and Ashland Avenue. 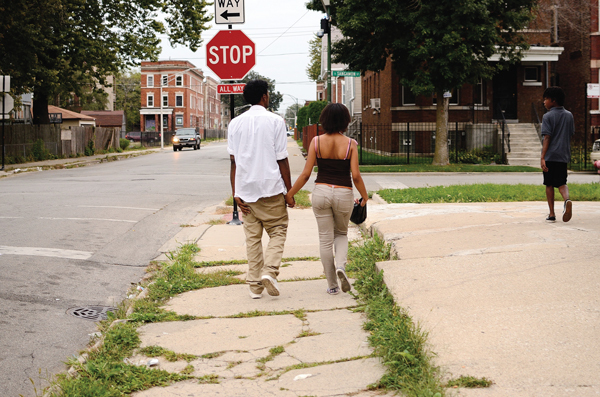 Yoshi—A young woman named Yoshi walks to her cousin’s house near 80th Street and Laflin Street in Auburn Gresham, the neighborhood next to Englewood.